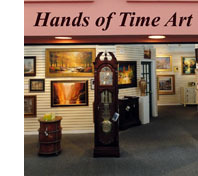 Hands of Time has been providing clock sales and service for the past 37 years. 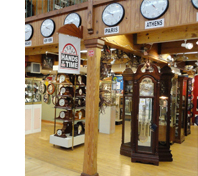 Our showroom, located in Historic Savage Mill, features a wide selection of new and antique clocks. All new clocks come with a full factory warranty. Our antique clocks have been individually serviced and each timepiece comes with a one-year warranty. While we began as a clock shop in 1978, over the years we have expanded to include home accent furniture, including curio and wine cabinets by Howard Miller and Pulaski. In addition, our fine art holdings include original paintings and limited editions by highly recognized contemporary artists as well as 19th and 20th century American and European paintings. As a full service clock repair and factory authorized service center, Hands of Time is open seven days a week to service your clocks and keep them running for generations. Remember, in store estimates are always free. We also make housecalls to service Grandfather clocks. 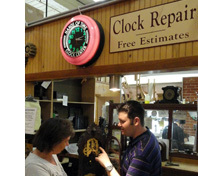 The clock repair department maintains the same hours as the showroom. We are open 7 days a week from 10AM to 6PM.